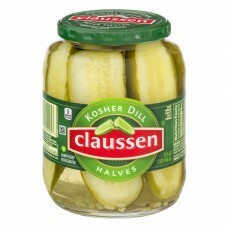 Claussen® Kosher Dill Halves. 5 Calories per serving. 32 fl oz (1 qt) 946 ml. Always chilled, never heated. Please have package available. Call: 1-800-322-1421. Visit us at: www.pickles.com. © Kraft Foods.